The future of oil extraction and transportation is one of the most contentious issues in Canadian politics. Plans for the construction of new pipelines to both the East and West coasts has entrenched old divisions between Eastern and Western Canada and opened up new schisms in Western Canada between sites of extraction and communities along pipeline routes. At the local level, people living in oil and gas-producing communities are being mobilized by oil advocacy groups to defend their industry from (perceived) attacks from urban environmentalists concerned with climate change. 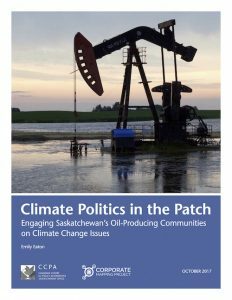 Climate Politics in the Patch: Engaging Saskatchewan’s Oil-Producing Communities on Climate Change Issues examines the beliefs and perceptions of people living in Saskatchewan’s oil-producing communities as they relate to issues such as climate change, environmentalism, and the contentious politics of oil. The participants in our study were largely dismissive over concerns about climate change, were antagonistic towards people they understood as urban environmentalists and Eastern politicians, and believed that the oil industry was already a leader in terms of adopting environmentally sound practices. Given these findings, we argue for a different way of engaging rural communities on the contentious politics of oil, one that focuses on the significant local impacts of extraction and the real grievances of people living beside oil infrastructure. We argue that our best hope of pushing past the current oil impasse will involve taking seriously the grievances of those living with oil, while articulating a concrete alternative economic/ energy vision for rural Saskatchewan communities. This paper is part of the Corporate Mapping Project (CMP), a research and public engagement initiative investigating the power of the fossil fuel industry. The CMP is jointly led by the University of Victoria, Canadian Centre for Policy Alternatives and the Parkland Institute. This research was supported by the Social Science and Humanities Research Council of Canada (SSHRC).